Nissan Kicks vs Hyundai Creta vs Maruti S Cross - Which SUV is best? Nissan Kicks vs Hyundai Creta vs Maruti S Cross – Which SUV is best? Nissan Kicks has been launched in India at Rs 9.55 lakhs. Indian version of Nissan Kicks is based on the B0 platform. This platform is utilized by many Renault-Nissan cars such as Captur, Duster, and Terrano. With the Nissan Kicks now officially launched, it is now time to take a closer look at Kicks and its rivals. Nissan Kicks will compete directly with Hyundai Creta and Maruti S Cross. Here’s a quick comparison between the rival SUVs to get an idea about which one would be a better option. Nissan Kicks vs Hyundai Creta vs Maruti S Cross. Dimensions: Nissan Kicks measures 4384 mm in length, 1813 mm in width, and 1656 mm in height. It has a wheelbase of 2673 mm. This makes Kicks bigger than both Hyundai Creta and Maruti S Cross. 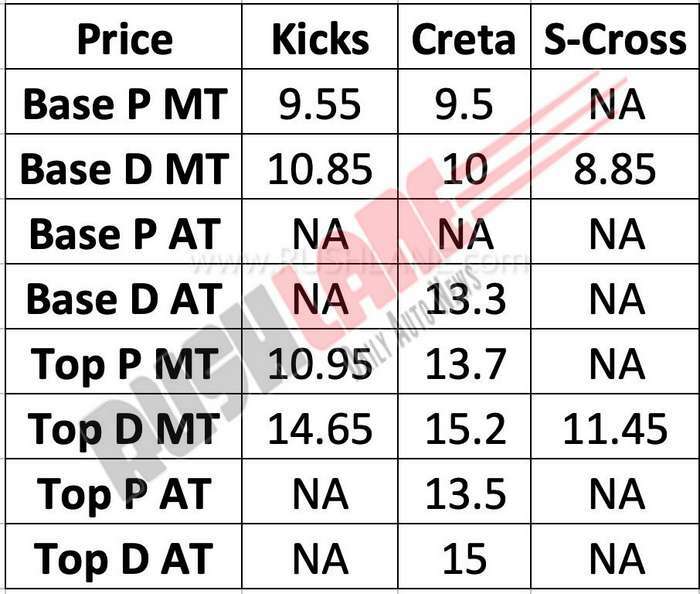 Creta is only slightly taller than Kicks by 9 mm, which is marginal. At 2673 mm, Nissan Kicks has segment-leading wheelbase, and coupled with its longer and wider body, it will help the SUV to dominate the roads. Engine: Powering the petrol Kicks is H4K 1.5L, 1498 cc, 4-cylinder in-line NR engine that makes 106 PS power and 142 Nm torque. Diesel variant is powered by K9K 1.5L, 1461 cc, 4-cylinder in-line NR engine that makes 110 PS power and 240 Nm torque. Petrol engine as 5 MT, while diesel has 6 MT. No automatic or AMT option is on offer. In comparison, Hyundai Creta petrol variant is powered by a 1.6L engine that delivers 123 PS power and 151 Nm torque. Diesel variant comes with 2 engine options. The 1396 cc, 1.4L CRDi engine delivers 90 PS power and 220 Nm torque whereas the 1582 cc, 1.6L CRDi VGT engine delivers 128 PS power and 260 Nm torque. Both petrol and diesel variants are available with 6-speed manual and automatic transmission. Creta petrol variant gives mileage of 15.29 kmpl whereas diesel variants give mileage in the range of 17.01 kmpl to 21.38 kmpl. 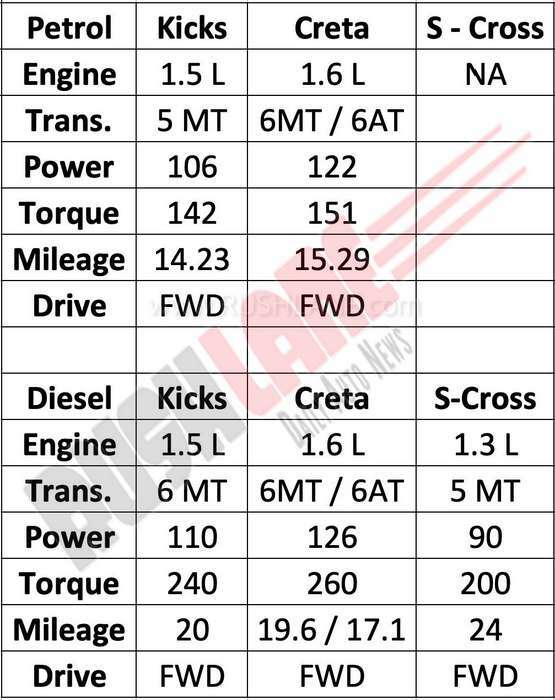 Maruti S-Cross on the other hand, is powered by the smallest of the engine in the segment. It is offered with 1.3 liter diesel engine, the same engine which also powers the Swift. This engine delivers 90 PS and 200 Nm via 5 speed MT. No automatic or petrol engine is on offer. The S-Cross claims class leading mileage of 24 kmpl. Safety and Features – Nissan Kicks is the newest entrant in the segment, and comes with some segment first features like the surround view 360 display on the 8 inch touchscreen infotainment system on the dashboard. This feature is usually seen on expensive cars over Rs 30 lakhs, and seeing such a feature in a car which is priced under Rs 15 lakhs, is worth noticing. 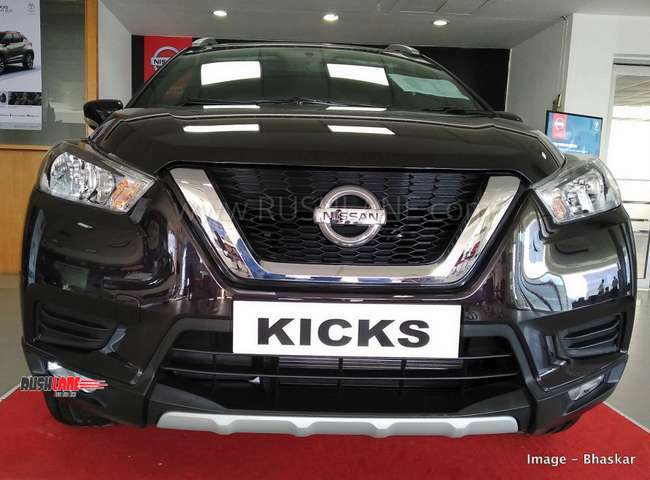 Other features on offer with the Kicks include 4 airbags, hill hold, ABS, EBD, best in class ground clearance of 210 mm, Nissan connect App, first in class LED projector headlamps, leather wrapped soft-touch dashboard, 17 inch alloys, roof rails with 100 kgs loading capacity, Auto AC, etc. 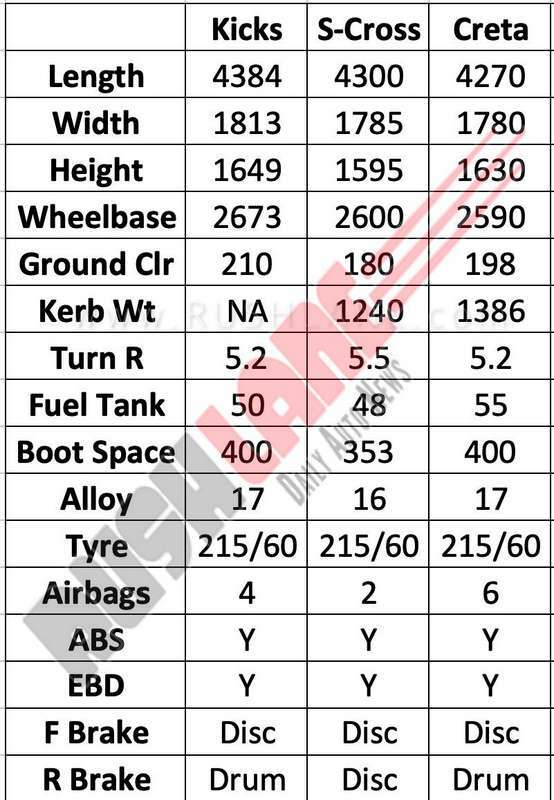 In comparison, the Hyundai Creta gets 6 airbags, ABS, EBD, 17 inch alloys, auto AC, reverse camera, leather seats, etc. Maruti S-Cross gets 2 front airbags, ABS, EBD, 16 inch alloys, front and rear disc brakes, Auto AC, smartplay infotainment system, reverse camera, etc. Pricing – Nissan Kicks is priced slightly more than the entry variant of Creta petrol as well as diesel. Petrol Kicks is Rs 5k more expensive, while diesel Creta is Rs 85k more expensive. Of the three, it is the Maruti S Cross is the cheapest of all. Top end variant diesel MT of Creta is more expensive than Kicks diesel top end. Conclusion – Hyundai Creta is the best selling car in the segment while Maruti S-Cross is the second best selling car in the segment. This order is not going to change with the launch of Kicks. Yes, Nissan Kicks does have its own advantages, comes with free 3 years warranty and RSA, but the overall package, including resale, is not considered as good as Maruti or Hyundai by consumers. Nissan India claims theirs is the best package, and are sure that Kicks will bring a turnaround in their fortunes in the country. It will be interesting to see how the Kicks performs in terms of sales over the next few months.